Please welcome our guest blogger today, Simon Wood, Anthony Award winning author of Working Stiffs, Accidents Waiting to Happen, Paying the Piper, Terminated, Asking For Trouble, We All Fall Down and the Aidy Westlake series. 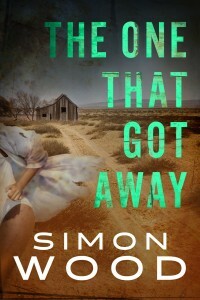 His latest thriller is THE ONE THAT GOT AWAY due out March ’15. THE ONE THAT GOT AWAY opens with Zoë Sutton and her friend, Holli, in grave danger. The Tally Man has abducted them and their situation is grim. Their futures can be measured in minutes, not years. That would be enough of a conflict for most writers. Not for me though. I have to take that awful scenario and make it worse. Zoë has to make a horrible decision—make a futile attempt to save Holli or use Holli as the distraction to help her escape. Zoë makes the hard decision—she escapes with her life and has to live with the guilt and shame of that single act of self-preservation. I think this shows quite a sadistic side of me that would make me worthy of villain status. Sorry, that’s just who I am. Long time readers will have seen this trait of mine before. So why do this? The honest answer is my upbringing. Not my childhood or anything but my work upbringing. I’m a mechanical engineer by schooling. I used to design safety equipment for oil refin eries and rigs that prevented noxious chemicals and gases that come up with the crude oil from getting into the atmosphere. That kind of work meant dealing with contingencies. If a valve failed, what was the bypass? If the bypass failed, what was the bypass’ bypass? It was all part of designing to multiple levels of failure. It’s no different than my flying experiences. Aircraft are very cleverly thought out. If one system fails, there’s another that can double for it. You’re taught to be able to fly with most of your gauges out of operation knowing that just a couple of things will guide you to safety. All this has taught me to view the world as a worst case scenario. In fact, a lot of my stories have been born by looking an aspect of the world and thinking of all the ways it can go wrong. I look at a bad idea and turn it into an apocalyptic nightmare. The gift and the curse of my engineering background is that it has made me all about piling on the conflict. When I write a book it begins with a flashpoint, which then sparks a number of other conflicts. I like the complexity of a disastrous situation gathering momentum, and it helps develop characters. The heroine, Zoë Sutton, and the villain, Marshall Beck, are created entirely as products of the story’s conflicts. Zoë’s self destructive nature is born from someone struggling with survivor guilt. Marshall’s world view and his need to kill is born out of the need to justify a killer’s behavior. I like to think it gives the story depth and gives the plot pace. But I’ll let you decide. 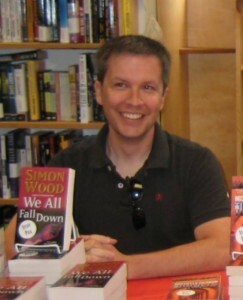 Simon Wood is a California transplant from England. He’s a former competitive racecar driver, a licensed pilot, an endurance cyclist and an occasional PI. He shares his world with his American wife, Julie. Their lives are dominated by a longhaired dachshund and four cats. He’s the Anthony Award winning author of Working Stiffs, Accidents Waiting to Happen, Paying the Piper, Terminated, Asking For Trouble, We All Fall Down and the Aidy Westlake series. His latest thriller is THE ONE THAT GOT AWAY due out March ’15. He also writes horror under the pen name of Simon Janus. Curious people can learn more at http://www.simonwood.net. This entry was posted in #amwriting, A Writer's Life and tagged Simon Wood by Clare Langley-Hawthorne. Bookmark the permalink. I’ll be on the road today for Spring Break so hope all you TKZers make Simon feel welcome! Thanks for letting me fill your shoes, Clare. I’m definitely intrigued! Gotta get that book when it comes out. Or is it already out? I’ll head over to Amazon and check it out. And what a fascinating life you’ve led – and continue to lead, Simon! Welcome to TKZ! Dachshunds are the most aggressive, prone to bite, dog breed. I’d think that looking for the worst case scenario would be very helpful to a thriller writer. Thanks for sharing, Simon! Great idea for drawing in the reader and keeping the attention riveted. I must look for your book…just that little bit had me hooked! This is timely. I downloaded this book as part of Amazon’s Kindle First promotion last month and was up until 1 this morning finishing it. I skew more toward action thrillers myself but I really enjoyed the story. It’s funny that you mention making bad situations worse. While reading, there were several times I wondered, “how many times can she be so close to getting away?” I was getting frustrated the more dire things became. Usually that doesn’t happen to me. It was all worth it the end though when the resolution finally came. As I was driving in to work I realized this was an area where I could use some improvement. I recently finished the first draft of my first novel. I’ve noticed that I tend to resolve minor conflicts along the way too quickly and allow the protagonist to overcome individual challenges too easily as they work toward resolving the overarching conflict. You had a number of good examples where there was a glimmer of hope that was quickly snatched away. You did an excellent job of ratcheting up the tension. That’s something I intend to work on.